Making and selling fishing lures can be a profitable venture. Fishing lures vary widely according to many factors including the type of fish, the type of water and the rod you're going to use. Making your own fishing lures is a challenging task, but if you discover a skill for the hobby, you can turn it into a money-making opportunity by selling them. Gather your materials according to the type of lure you plan to make. A saltwater lure is made differently than an ice fishing lure, which is different from a fishing spoon, and so forth. Here we'll focus on a simple wooden lure. Usually the supplies for both a wooden freshwater and saltwater lure will be similar: wood (cedar is most common, but harder wood is used for saltwater lures when going after big fish), a lathe to shape it and screw eyes to attach the fishing hooks. Shape the plug of the lure in the lathe. Surface plugs work well with both casting and surf fishing, and the shape doesn't have to be very fancy---a simple long bullet shape will do, about 7/8-inch wide and between 4 and 7 inches long. The plug needs to be long enough to attach at least two hooks2, three hooks for larger plugs. Attach the screw eyes to the plug. They should be at least one inch apart from each other, running down the length of one side. One screw eye needs to be attached at the nose of the plug so you can attach it to your rod; attach fishing hooks to the other eyes. 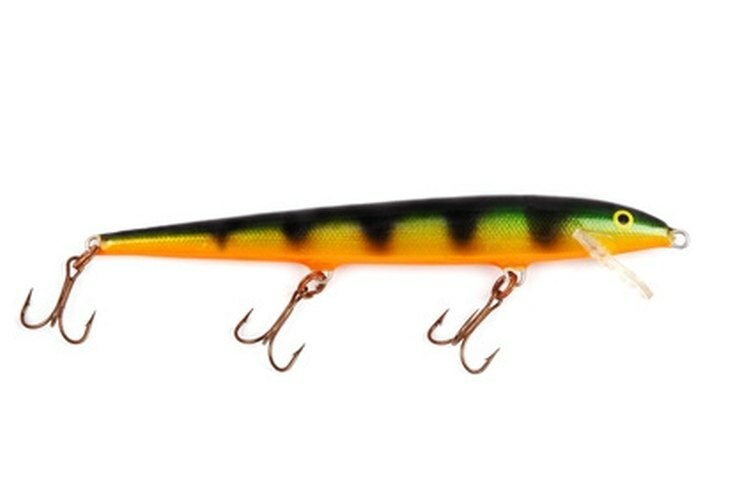 Paint the lure as you see fit. Most often the lures are painted to look like small fish, but this isn't necessary. Contact fishing and bait stores near you to see if they work with any local suppliers. Sometimes a store will buy a number of lures from individual suppliers and resell them outright, or---more commonly---allow the lure crafter to sell products by consignment, where your inventory is given a specific period to be sold before you reclaim them to sell elsewhere. Open a website selling your lures. This step is optional, but highly recommended as it will open your business to a wider customer base than you would have selling in local shops alone. Research the various Web hosts available, and find one that offers a reasonable price on a site with no advertisements. GoDaddy.com is a popular choice for startup businesses, offering packages in various price ranges---all of which are ad-free. If you're not technologically inclined, find a site that has premade templates and only requires you to input information rather than HTML or Java coding. Freeservers.com offers simple websites with templates and themes already built into their system, requiring little effort to set up. Create business cards once you've found a store that will allow you to sell your creations. This step is also optional, but your customers will appreciate putting a name to the product and may be more inclined to buy from you again in the future. Consider that a saltwater lure is lost more easily than a freshwater lure when you sell your supplies, due to harsher water conditions and generally larger fish; it may be in your interest to make more of one than the other. You're not limited in the type of lure you can make. There are different lures for different purposes; research these differences and see if you can make more than one kind of lure, to offer your customers greater variety.